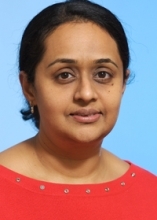 This month we invite you to explore some of ITEST's work in computer science and computational thinking in our December Monthly Highlight. We also take a closer look at ITEST PI Fred Martin's Middle School Pathways in Computer Science in our Project Spotlight. On the STELAR blog Joyce Malyn-Smith, Senior Advisor to STELAR, discusses the importance of computational thinking in providing the skills needed for success in a technology-driven world. Workforce development is the heart of the ITEST Program, and in support of this, STELAR is pleased to introduce our new partner, Advance CTE. Their vision is to support an innovative CTE system that prepares individuals to succeed in education and their careers and poises the United States to flourish in a global, dynamic economy through leadership, advocacy and partnerships. We invite you to join us for an introductory webinar on their work on Wednesday, January 25. As we continue to explore new ways to support your work, we are pleased to announce a new system for better connecting you with the ITEST community. ITEST Virtual Meet-ups - online meetings of small groups of ITEST project leaders connected by a common theme or area - will be coordinated with active projects beginning in January. Another way to connect with the community and lend your voice to our collective work is by joining the Program Committee for the ITEST PI & Evaluator Summit in June 2017. See full details in the call for volunteers below. Finally, we are pleased to announce the 2017 NSF Video Showcase: Research and Design for Impact. We invite all ITEST projects to share your cutting edge work by creating a 3-minute video to present during a week-long interactive online event May15-22, 2017. We wish you all a safe and happy new year, and look forward to connecting with you in 2017! STELAR recently connected with members of the Middle School Pathways in Computer Science ITEST project, Principal Investigator Dr. Fred Martin and Akira Kamiya, Teacher Learning Center Director. 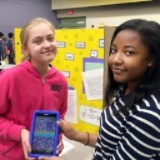 This project brings a computing curriculum based on creating socially-relevant mobile apps, taught by existing public school teachers, to a diverse middle school population. "Students are naturally excited about building apps. As an introduction, our teachers focus on media-rich examples, and encourage students to make apps that connect with their personal interests and passions." View the entire interview in this month's Project Spotlight. 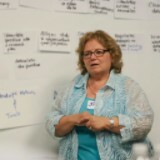 In a piece originally featured on Education Development Center's blog, Issues and Insights, STELAR Senior Advisor Joyce Malyn-Smith shares her thoughts on why every student should develop computational thinking skills, how CT can be used in the K-12 classroom, and the importance of advancing this learning. "...it’s important for schools to prepare young people with computational thinking skills because these skills are generalizable—and desirable—across all sectors impacted by technology." Read more on the STELAR blog. Join the Summit Program Committee! STELAR is currently looking for collaborative and motivated volunteers to participate in the Program Committee for the ITEST PI & Evaluator Summit in June 2017. Committee members will work with STELAR to design the agenda and format, select presenters, and facilitate sessions during the summit in order to shape conversations within our community. Committee members are recognized for their efforts and will be visible to NSF and within the ITEST community of practice. Write to bschillaci@edc.org to indicate interest or if you have any questions. The 2017 Summit will be held on Thursday, June 15 and Friday, June 16, 2017 at the Westin Arlington Gateway in Arlington, VA.
On Wednesday, January 25, STELAR is pleased to host our partners Kimberly Green and Kate Kreamer of Advance CTE to discuss Career Technical Education (CTE) with the ITEST community. 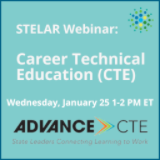 With the resurgence in interest in Career Technical Education (CTE), this webinar will provide you with foundational information about the current state of CTE. What is CTE’s reach, impact and the current trends in policy and practice at the state and federal levels? Hear about efforts by states to connect CTE and STEM, including highlights from Advance CTE’s publication “CTE is your STEM Strategy." ITEST projects are invited to present at the third annual interactive, online video showcase event taking place on May 15-22, 2017. Share your cutting edge project work by creating a 3-minute video, then discussing it with your colleagues, stakeholders and the public during a week-long interactive event. Registration, which is mandatory for participation, will begin on January 9, 2017. People Connector Directory: Use our People Connector Directory to find people who have skills you need, or to list yourself as a resource to others. STELAR is seeking your project news items! Has your project been featured in the press or media? Send us a message to let us know the details! STELAR is supported by NSF grant #1312022 (STEM Learning and Research Center (STELAR)). Any opinions, findings, and conclusions or recommendations expressed in this material are those of the author(s) and do not necessarily reflect the views of the National Science Foundation. Copyright © 2016 Education Development Center, Inc. All rights reserved. STELAR News is a monthly newsletter by the STEM Learning and Research Center.